You know what I've always wished would work, but never really seems to do the job? Acne treatments. I've tried them all -- anytime I come across a gel, cream or mask that claims it will diminish my pimples almost immediately, I figure it's worth a shot. And usually I remain disappointed ... until I came across the amazing Bliss Change Your Spots. I was first introduced to this wondrous product while getting a facial at Bliss 49. My facialist recommended it, telling me that it was guaranteed to work. "Sure, sure," I thought to myself. But I figured why not? I'll give it a try. So I purchased it, brought it home and slathered it across the offensive spots. I'll be darned if the next day my pimples were diminished almost to the point of oblivion! Thinking it must have been a fluke, I continued to use it over the next two months whenever I found a pimple either already formed or just beginning. And I'm telling the truth when I say it made them disappear EVERY SINGLE TIME! 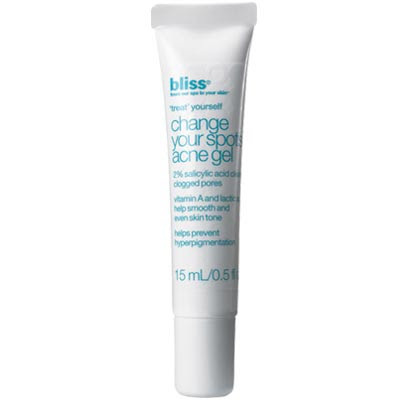 The cool, pale blue gel is formulated with salicylic acid to dry out the offending red spots. I've found that it makes them disappear within three days at most, and that's for the really huge ones that seem like they'll never go away! It also contains oil absorbers, alpha-hydroxy acids and licorice extract to prevent excess shine and hyperpigmentation.